FOR FOUR SEASONS now, the Golden State Warriors have been the NBA’s most dominant offence thanks to a high-octane system that promotes ball and player movement and, of course, three-pointers. But it’s easy to forget that in 2014, when Steve Kerr became head coach, he was taking over a team that underwhelmed on offence and often played a stagnant, one-on-one system. 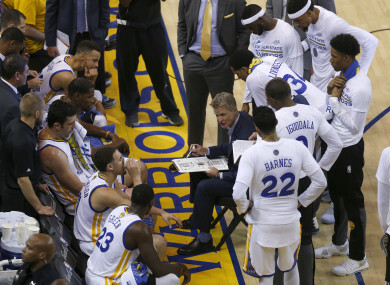 As ESPN’s Baxter Holmes recently documented, when Kerr was hired, he envisioned an up-tempo, pass-happy system that borrowed elements of Phil Jackson’s triangle offence and mixed it with the Warriors’ lethal shooters. However, early in the job, he had not yet diagrammed what the offence would look like. As it turns out, one of the first people to ever hear and see Kerr’s vision was a bartender named Kevin Ninkovich at the San Francisco airport, who asked Kerr how he would change the team’s offense. According to Holmes, Kerr and assistant coach Bruce Fraser ordered two glasses of wine and a charcuterie board at the bar. After Ninkovich asked Kerr what the offence would look like, Kerr had his own version of a whiteboard right in front of him. And then, as Fraser looks on, Kerr swipes clear the wooden board, casting the handle in the role of a basket. He positions the board’s dried cranberries and marcona almonds into two five-on-five teams in a half-court setting, with the cranberries relegated to defense. Suddenly, Almond Stephen Curry, hovering near the top of the key, swings an imaginary ball to Almond Klay Thompson on the wing, then cuts to the near corner while Thompson dumps it down to Almond Andrew Bogut. Thompson and Curry set picks for each other along the perimeter, while Bogut weighs his options: find open almonds or back down his helpless cranberry. According to Holmes, Ninkovich simply watched for 10 minutes as Kerr, for the first time, diagrammed the hybrid offence he had been imagining for weeks. As Holmes noted, the Warriors’ offence did not completely jump off the page at first. They sometimes struggled to keep up their passing and were far too careless with the ball, leading the league in turnovers. Sloppiness is still an occasional problem for the Warriors, but overall, they’ve come a long way under Kerr and are now considered unguardable. Future first-time head coaches, take note: charcuterie boards and wine bars can apparently be effective tools for designing offences. Email “Steve Kerr first unveiled the NBA's most lethal offence on a charcuterie board to an airport bartender”. Feedback on “Steve Kerr first unveiled the NBA's most lethal offence on a charcuterie board to an airport bartender”.